Relieve your loved one’s aches, pains and stress this holiday season and throughout the year. Is your loved one suffering from chronic soft tissue pain, rheumatism, arthritis pain or just plain stress? 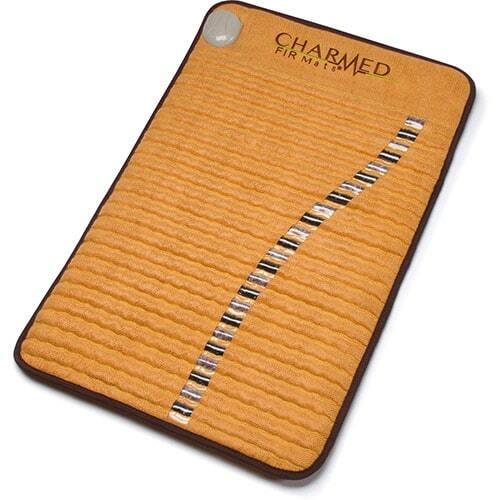 This unique Christmas gift is designed to help reduce the suffering with deeply penetrating heat, up to 5”. 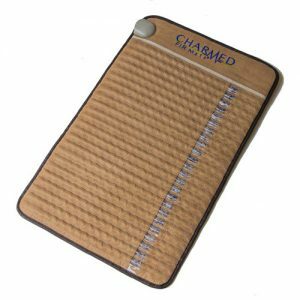 The Charmed FIR Mini Mat is ideal for placing under a mattress pad to maximize convenience if one reads or watches TV in bed or under a towel on the sofa. Just 30-60 minutes a day at higher temperatures produce miraculous results and must be tried to be believed. The mat features auto temperature control and timer shut-off, so your loved one can adjust the heat to suit his or her preference and time it to shut off after 1 to 12 hours. Filled with 6 1/2 pounds of therapeutic amethyst and tourmaline crystals, the mat emits negative ions to calm and help heal the body from the inside out. Amethyst has been recognized for centuries to treat aching bodies and overwhelmed minds with its calming and soothing qualities while tourmaline is know for its healing power as well as its detoxification abilities. With this mat, your loved ones can now experience relief in only 30-60 minutes a day while reading or watching TV. I have Chronic back pain and look for ways to help with the pain. I would love to see if it helos.